With the presence of a large pool of participants, the global dental implants market is displaying a highly competitive business landscape, finds a new research report by Zion Market Research (ZMR). Zimmer Biomet Holdings, Incorporation, Henry Schein Inc., AVINENT Implant System, S.L. Bicon LLC, Danaher Corporation, Straumann Holding AG, Dentsply Sirona Inc, and Ivoclar Vivadent AG are some of the key vendors of dental implants across the globe. These players are focusing aggressively on innovation, as well as on including advanced technologies in their existing products. Over the coming years, they are also expected to take up partnerships and mergers and acquisitions as their key strategy for business development, states the dental implants market study. Citing an instance, on September 25th 2018, Henry Schein Incorporation – a leading global provider of healthcare products & services for office-based medical practitioners as well as dental & animal health practitioners- declared that it will reinforce and expand its dental implant business portfolio via three major investments. Reportedly, the firm has acquired Intra-Lock- a U.S. based dental implant firm. Sources cite that Henry Schein is trying to expand across dental implants market through planned purchase of a majority of shares of Medentis Medical – a Germany-based dental implant firm. In yet another acquisition, Henry Schein acquired major interest in Pro-Cam Implants – a firm offering major distribution services of CAMLOG in Holland. As estimated in this report, the global dental implants market stood at US$ 5.08 billion in 2017. 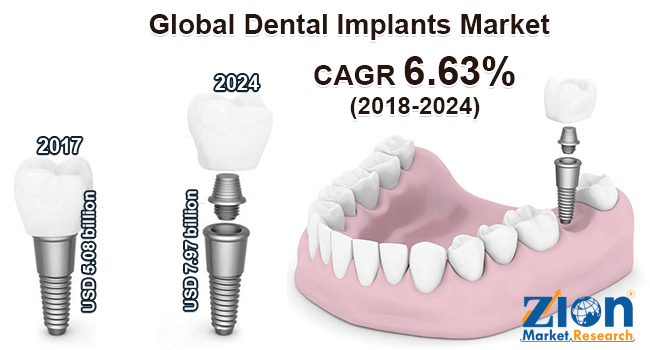 Witnessing a tremendous rise during the period from 2018 to 2024, the revenue in this dental implants market is expected to reach US$ 7.97 billion by the end of the forecast period. The main products available in this dental implants market are Endosteal implants, Subperiosteal Implants, Transosteal implants, and Intramucosal implants. Among them, the demand for Endosteal implants is relatively higher and the trend is anticipated to remain so over the next few years, notes the research report. “Rapidly expanding geriatric population more susceptible to teeth decay and cosmetic issues is likely to boost dental implants market trends over the forthcoming years,” says the author of this study. Apart from this, massive demand for dental implant procedures along with introduction of new technologies in the domain of dental implants is expected to create lucrative avenues for dental implants market in the near future. In addition, growing use of dental implants in myriad therapeutic regions coupled with escalating popularity of prosthetics are few of the key growth drivers of dental implants market. Furthermore, large number of dental injuries occurring due to road collisions and sport injuries will further add towards the surge in the expansion of dental implants market revenue in the upcoming years. Regionally, Europe has been leading the worldwide dental implants market and is anticipated to continue on the dominant position in the years to come, states the dental implants market study. Increase in aging population base, dental tourism activities, and changing views about oral healthcare are few of the major factors contributing towards the dominance of the Europe dental implants market. Widespread cases of periodontitis witnessed among the population of Europe are yet another significant factor that is expanding the scope of dental implants market in Europe.